Ancient Greek civilisation provided the foundations for Western culture. One of the empire’s most recognised legacies is Greek mythology, which had an extensive influence on arts and literature in the West. Greek myths tended to describe the lives of Greek Gods including their births, victories in battle, love affairs and their connection to certain city-states. One artifact which pays homage to Greek mythology is Ancient Greek coinage. Greek currency was the first to be minted on an imperial scale and has influenced commerce across the world. Coins were hugely important as a medium of exchange and an important store of value and source of prestige. Greek coins used a combination of figures, symbols and inscriptions to symbolise each ruler’s territory. Each city state in Ancient Greece was said to be protected by a certain character from Greek mythology and one of the most identifiable features of Greek coinage are the Gods and Goddesses which are struck on many of the coins of the time. I have taken a look at some of the most famous myths that were struck on coins from the time, some over 2,000 years old! Issued in the 2nd century BC this coin depicts Zeus the chief of the gods and believed to be the ruler of mankind. It’s believe that Zeus saved his brothers, Poseidon and Hades, after they had been eaten by their father Cronus. The three of them divided creation between them. As the Father God, Zeus was the dispenser of good and evil and the upholder of morality. 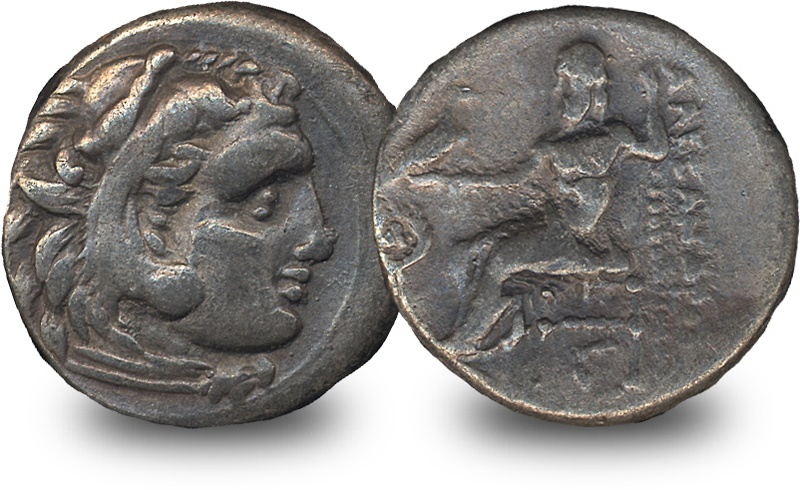 Alexander the Great often issued coins depicting himself dressed as Hercules, wearing a headdress made of the scalp of the Nemean lion – one of Hercules’ “12 tests”. Hercules is famed for being the strongest of all mortals. However, his physical power was offset by a lack of intelligence and strong emotions. Many of Hercules’ great deeds occurred while doing penance for stupid acts done in anger or carelessness. This coin is an example of one of many coins issued depicting Apollo, the son of Zeus. Apollo is considered a complex god of many things including music, poetry, art, oracles, archery, plague, medicine, sun, and knowledge. He is often depicted playing the lyre and is represented as an ever youthful god. Issued in the 1st Century BC this coin depicts Ares, the God of war and violence. Fittingly the reverse of this coin features a sword. Ares was a superior fighter in battle and caused great bloodshed and destruction, but he also had a reputation for being cowardly. 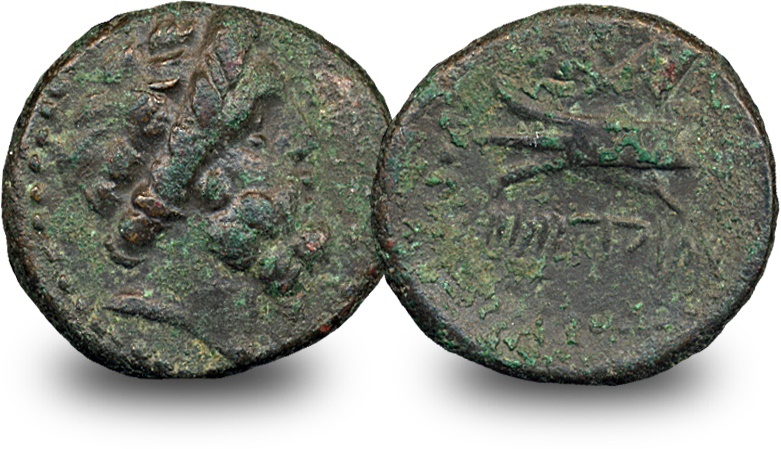 This coin features the Dioscuri; the twin brothers of Castor and Pollux. Pollux, the son of Zeus, was immortal but Castor was mortal. When Castor was murdered, Pollux asked his father Zeus if he could share his immortality with his brother. So they transformed into the constellation Gemini, able to travel back and forth between Olympus and Hades. They are also known as protectors of sailors, able to calm the seas and winds in storms. Medusa was the only mortal of the three powerful winged Gorgon sisters. It is believed that Medusa was transformed into a monster by Athena. Medusa’s hair was made of snakes, although it is depicted as wild leaves on this coin, and she was said to be able to turn people to stone with a glance. She was killed by the hero Perseus, who used the metal of his shield as a mirror to avoid eye contact with Medusa. This small silver coin is known as a “tertobol” and weighs just over 2 grams. It pictures Histiaea, the nymph, on both the obverse and reverse. Histiaea was named after the ancient city of Histiaea on the second largest Greek island, Euboea. Mythical Naiads lived in the lakes here and being immortal, were invited to the assemblies of the gods on Mount Olympus. Poseidon was worshipped as the god of the sea, earthquakes and horses. Poseidon is often portrayed with his best known weapon, the trident, which he used to shake the earth and create storms, causing devastating earthquakes and tsunamis. It is this trident that is featured on the reverse of this coin. The coin was issued by the Syracuse in the 3rd Century BC, as Poseidon was greatly important to them as a maritime city/state. Tyche was the personification of fortune and controlled the luck and prosperity of a city. On this coin she is depicted with a crown of city walls and the reverse depicts a cornucopia, a symbol of good fortune. Tyche was said to have carried a large horn containing riches, which she would sporadically spread to individuals and cities. When no cause could be discovered for events such as floods, droughts or political upheaval, they were often attributed to Tyche. Now you have the chance to own The Zeus ‘King of Gods’ Bronze Coin, which is over 2000 years old. How many people can say they own a piece of ancient history whose story has had such impact on the world today?